Winter weather blew in yesterday evening in Providence. After a warmer than usual fall and early winter, colder weather is upon us. Parents should reevaluate their safety precautions each season to prevent possible injuries. Winters in Rhode Island reach as low as 20 degrees Fahrenheit with wind chill bringing the temperature down even more. Rhode Island averages 34 inches of snow each year; snow can make winter clothing that much more important. A child is much more susceptible to colder weather conditions because their bodies release heat faster than the average adult. Layers are recommended for everyone during the winter, but it is especially essential for children. It is recommended to give a child one more layer of clothing than what an adult would wear. Covering the child’s head, neck and hands with the proper clothing to prevent heat loss. Waterproof clothing should be utilized in states that experience snow or rain between November and February. Puffy winter coats need to be taken off of children when riding in car seats. A bulky coat can make parents think that the harness of a car seat is tight enough. Laying a blanket over the child is another option to keep them warm without having a coat on. The younger a child is the more frequent they should be checked on. Make sure to bring children inside after getting wet or when they become cold. After being warmed up, routinely check in to make sure they are warm. Sunscreen is often forgotten on a cloudy winter day but is important for children and adults. Sun reflects off of snow, so reapply every couple of hours. The cold air can lead to nosebleeds and skin irritation, lotion and an air humidifier will help. Hydration is essential in every season; dry winter air leads to kids losing water through their breath. Having water and warmer drinkers on hand, as well as, soup will hydrate adults and children. Children should never be left alone outside. Make sure that a buddy system in place for older children and their friends. 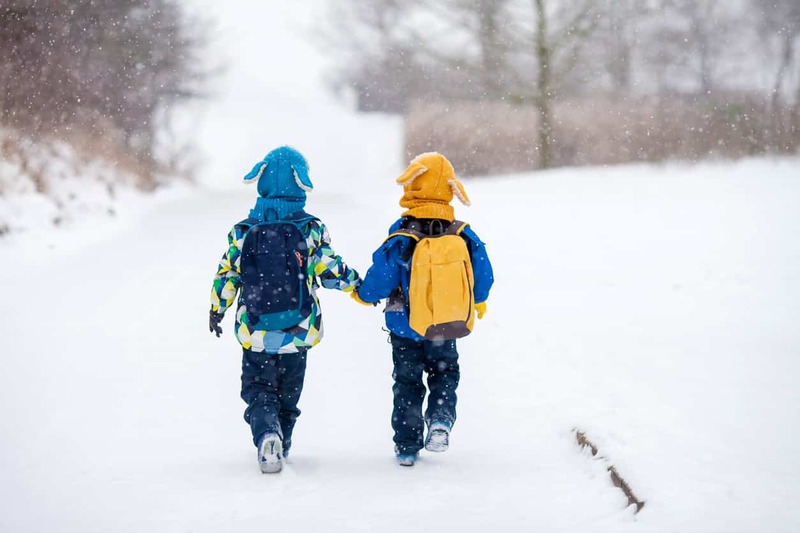 Kids 8 years old and younger should always be supervised outside during the winter. Having your child’s play areas be near warm shelters like your home or a friend’s home is smart. Drawstrings and stringy scarves catch on playground equipment. Velcro and clothing with snaps should be used instead.